Alcatel already started the phone madness at CES with the world’s thinnest smartphone and another 5-inch 1080p monster phone, but it also took care of users on budget with this newly announced Alcatel One Touch Pop lineup. It consists of four colorful and fun devices, one of which will actually try and make a splash in the United States. Without much further ado, first comes the Alcatel One Touch X’Pop, a high-end model coming to Asia, Africa and the Miiddle East as soon as this month. The X’Pop features a 4.5-inch qHD display powered by a 1GHz dual-core processor, 512MB of RAM and a 5-megapixel camera. Second comes the Alcatel One Touch M’Pop, a US-bound smartphone running on Android 4.1 Jelly Bean, with a 4-inch WVGA screen, 1GHz processor, 512MB of RAM and a 5-megapixel camera on the back. The 4-inch screen should be a perfect asset for those who value one handed use. 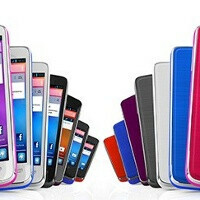 Next comes the Alcatel One Touch S’Pop, a phone with a 3.5-inch HVGA display, Android 4.1 Jelly Bean and a 3.2-megapixel camera. As you probably have already guessed, this would be a much more affordable device, but also feature a 1GHz processor and 512MB of RAM. The Alcatel One Touch T’Pop goes even lower on the affordability scale to downright cheap. The compromise is 256MB of RAM and Android 2.3 Gingerbread at the same 3.5-inch display and 1GHz processor.